The Yenisey Day is an environmental holiday established by Viktor Zimin, the head of the Government of Khakassia and chairman of the Guardian Council of the Khakass branch of the Russian Geographical Society. 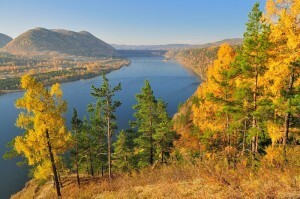 This holiday celebrates the Yenisey River—one of the most important rivers for people living in the Siberian Federal District. The Yenisey Day is celebrated on the last Saturday of September. Within the holiday celebration, various organizations in Khakassia arrange quizzes, cleaning days, round table discussions, art contests, and festivals. First Yenisey Day in Khakassia was held on September 29th, 2012. Yenisey River’s annual flow rate is about 624 km3, which makes it the Russia’s largest river in terms of river flow. Yenisey River is one of the world’s longest rivers: from the confluence of Bolshoy Yenisey and Maly Yenisey rivers, it runs for 3,487 km. Yenisey River flows through Krasnoyarsk, Abakan, Kyzyl, Sayanogorsk, Divnogorsk, Yeniseysk, Turukhansk, Igarka, Dudinka, Shagonar, Minusinsk, Sosnovoborsk, Lesosibirsk, Zheleznogorsk, Cheryomushki, Maina, Shushenskoye, Ust-Abakan, Novosyolovo, Berezovka, Atamanovo, Kazachinskoye, Kureika, Ust-Port, and Karaul. Fauna of the Yenisey River basin counts 46 fish species and subspecies, and a fish-like vertebrate, which belong to 14 families. The Save the Birds’ World campaign in Khakassia has been held for more than 6 years. Its main goal is to attract public attention to the problems of wintering and migratory birds in order to preserve their population and diversity. The participants of the campaign make and hang bird feeders for wintering birds, birdhouses for migratory birds, and share information to engage more people in these activities. People of all ages can participate in the campaign. 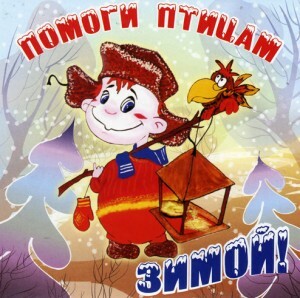 The Save the Birds’ World campaign is held in Khakassia from November 20th to April 1st. The Khakassky Reserve invites everyone to participate in it, and share photographs of your bird feeders and their visitors. March for Parks is an international campaign for nature conservation and attracting public support to protected natural areas of Russia and the Commonwealth of Independent States. The main aim of the campaign is to engage authorities, mass media, business companies, and people in solving the environmental problems of our region, and tell them about natural and cultural heritage of our nature reserves and national parks. March for Parks campaign in Khakassia has been held since 1996. Since then, the campaign has achieved a status of a republican ecological movement. Every year the campaign unites schoolchildren, teachers, students, and journalists. The Khakassky Reserve has gained extensive experience, we arrange various events withing the campaign to make it more attractive for thousands of participants. 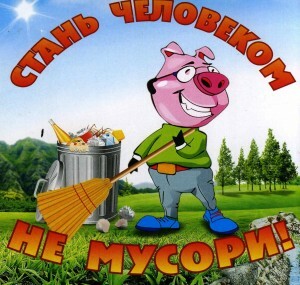 Cleaning campaigns are one of the most effective environmental events that unite people of all ages. The main goal of the Clean Up the World campaign is to raise public awareness of health, ecology, and environment, help people realize how they are connected to nature, and engage them in environmental and ecological activities. During the Clean Up the World campaign, the participants clean up streets, parks, and recreation zones. The Khakassky Reserve invites everyone to participate. The campaign starts on September 7th, and ends on October 20th. Say “No” to Wildfires campaign is supported by the Ministry of the Russian Federation for Civil Defence, Emergencies and Elimination of Consequences of Natural Disasters. The main aim is to draw people’s attention to the problem of wildfires on reserve’s protected territories and bordering areas and to tell people about the damage brought by wildfires to flora and fauna of the republic. The campaign includes lectures and meetings at schools, children’s centers and preschools. The Say “No” to Wildfires campaign starts in April and ends on May 22nd. 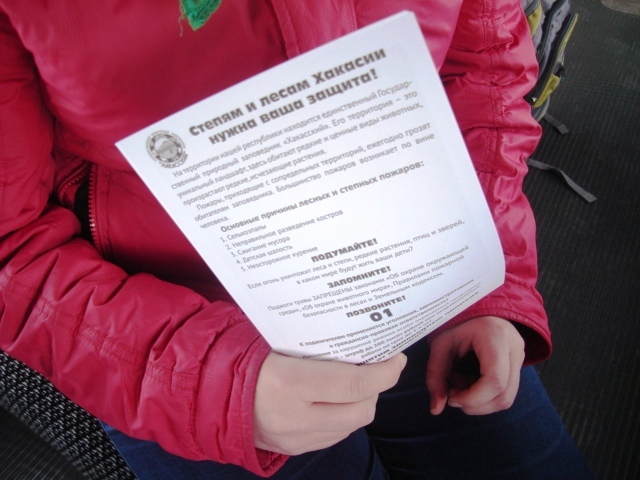 The campaign is held by the Khakassky Reserve and children’s activity centers of Tashtyp and Abaza. The main aim is not only to preserve trees and raise environmental awareness, but also to develop creative skills of the participants—children, their parents and teachers. Together they make a Christmas tree that will decorate their houses instead of real trees. The campaign starts in November and ends in the end of December. The best handmade trees are then presented in the exhibition.